With cold winter temperatures looming around the corner for much of the northern hemisphere, the arid frigid air seemingly brings along with it dry, itchy skin. Yet, for a fair number of people this type of skin malady is a constant part of life, regardless of the season. 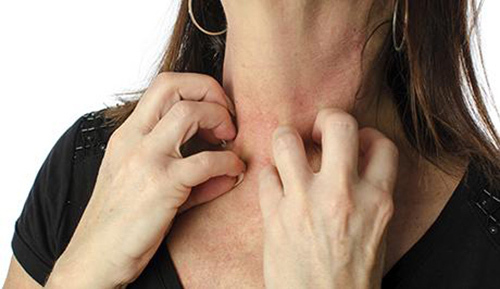 Atopic dermatitis—commonly known as eczema—is a common inflammatory skin disorder that affects one out of every five children and between 5-10% of the adult population. While inheritability patterns and some genetic markers have been identified for the disease, most of the genes responsible for the skin condition have yet to be determined. Now, an international team of scientists from clinical researcher centers across the globe have conducted the largest study to date of atopic dermatitis, pooling data obtained from 377,000 subjects in 40 different projects around the world. Among the new candidate genes for eczema, the researchers came upon loci that are important for the innate immune system and for the development and function of T-cells, which play an important role in various immune responses. Interestingly, the newly identified genetic regions show a robust correlation with known risk loci for other immune disorders such as asthma, allergies, and other chronic inflammatory diseases like Crohn's disease and psoriasis, as well as with autoimmune diseases. For this study, the researchers incorporated a total of 21,399 cases of European, African, Japanese, and Latino ancestry in 22 different studies comparing them with 95,464 controls. Moreover, the findings were then replicated in 18 studies of 32,059 cases and 228,628 controls. “While not detracting from the importance of maintaining the skin barrier in the prevention and treatment of atopic dermatitis, our findings lend support to new therapeutic approaches targeted at immune modulation,” concluded the investigators.